Detectives Beyond Borders: Algeria is to France and Vietnam to the U.S. as ? is to ? Algeria is to France and Vietnam to the U.S. as ? is to ? I'd decided to let Algeria lie for a while until a pair of passages in Fred Vargas' The Ghost Riders of Ordebec made me realize Algeria must have penetrated the French consciousness and conscience the way Vietnam did in the United States. "taken off active service and they put him into interrogations. Torturing people." Revelations of torture during the war shocked the French public, and the matter still comes up in occasional legal cases. That Vargas could invoke torture and Algeria in a novel published in 2011 (English translation, 2013) suggests at least some in France are still haunted by the subject, and the character in Vargas' book said to have engaged in torture suggests that Vargas regards torture as the materialization of the worst that France has ever done and torturers as the real-life embodiment of the evil spirit always hinted at in her books. If Algeria is France's conscience and its nightmare, if Vietnam played a similar role for the United States, what are their counterparts for other countries? And have those counterparts appeared in crime fiction? Yes on all four. Irish crime writers only know starting to write about the troubles will tell you there has been much reluctance in the UK to addressing the Troubles. I wonder if the same holds true for those other colonial/imperial involvements. Although I find your "relationship" premise interesting, I can't see that the basis is accurate. Algeria was a part of France, Vietnam was never a part of the US. Living both in France and the US, I can't see that Vietnam has penetrated the American consciousness and conscience nearly as deeply as Algeria has penetrated the same of France. Italy/Ethiopia yes, but Libya shows up as a comparison more often in Italian literature. The Ethiopian campaign in WW2 is really one of the most interesting stories of the war and almost entirely unknown. Orde Wingate operated a very effective guerilla force that brought the Italians to their knees and then marched in triumph with the Emperor as he reentered Abyssinia. "Algeria was a part of France"
Well, that's the crux of the matter, isn't it, and probably accounts for why Algeria's split from France was so much bloodier than were Tunisia's and Morocco's. I would guess that Vietnam percolated into American consciousness and popular culture as deeply as Algeria into France's, but that the impact has begun to fade. Algeria, on the other hand, remains to the fore both because of events there and in France. I have seen repeated references and allusions to Algeria in French crime writing, not just in political crime writers like Didier Daeninckx and Dominique Manotti, but also in Vargas. References to North Africa crop up in Italian crime writing, too, but I've never seen a reference to Ethiopia in a recent Italian crime story. The country is probably too remote in time and space. Adrian: Orde Wingate's name had come down to me through Palestine. I didn't know he was such a pro-Zionist anti-colonialist guerrilla, though. I also don't remember his name coming up in Ryszard Kapuściński's book about Haile Selassie, though that was about the emperor's last days. Not wanting to split hairs, but . . Since the Vietnam war is more recent than the Algerian conflict and Vietnam's impact is already fading in the US while that of Algeria's in France is not, I question the equality of the depths of penetration. As a comparison to Algeria/France I would only suggest Ireland/England. I, too, don't find much on Ethiopia but Italians do write about Libya and Tunisia. After all, gorgeous Claudia Cardinale is a Sicilian from Tunis. Perhaps, this is another topic but just to add . . Italy has never done much of a job of facing war crimes it committed. Angelo del Bocca writes at length about this topic. 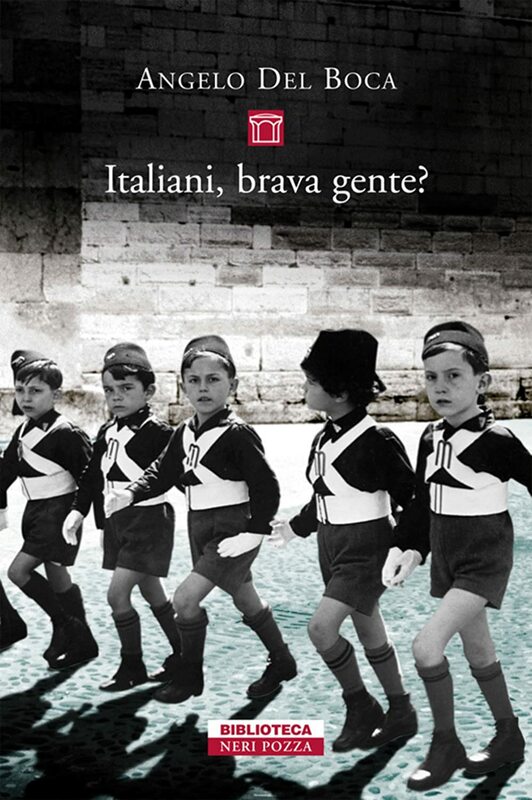 One excellent book is "Italiani, brava gente?" I asked an Italian friend about why Italy always seemed to "get off" easily. He said, "We always kill the emperor and beg for mercy"
Anonymous, if you state the argument that way, yes, Algeria had penetrated more deeply into the French consciousness. For a while, though, the messed-up Vietnam veteran was a staple in American books and movies. I've been reading much Algerian and North African history, and Alistair Horne in particular often invokes Northern Ireland as a parallel with Algeria. I did not know Claudia Cardinale was a Sicilian from Tunis but, looking back on her stunning appearance in Big Deal on Madonna Street, I am not surprised. Anonymous: In re killing the emperor and begging for mercy, maybe Italy has the luck to fight alongside villains worse than they. That book certainly has a scary cover. Interesting that the worst abuses the book cites happened in countries where, as far as I know, Italian is no longer spoken. That probably contributes to the isolation of the abuses from public consciousness. In re Libya, I read somewhere that there were seven university graduates in the country at its independence. Italians, that is, may not have done much that would perpetuate their culture after their departure. In Algeria, on the other hand, French was so ingrained in people’s everyday lives that any number of Algerian writers feel compelled to account for their decision to write in that language (Yasmina Khadra, Assia Djebar, Kateb Yacine, etc.). Where did you find that cover? Scary indeed!! Mine, an old copy, has just a plain title. "Interesting that the worst abuses the book cites happened in countries where, as far as I know, Italian is no longer spoken. That probably contributes to the isolation of the abuses from public consciousness. Excellent point!! And your first paragraph was right on, too. But Professor del Boca is trying. I wonder how many Italians actually read his books. And as far as the French . . many Algerian writers live here and the French do publish their books. Anonymous: I did a search for the title, and that came up, It's from Amazon;s listing. Yasmina Khadra says he chose to write in French rather than Arabic because his French teacher encouraged him, while his Arabic teacher did not. ANd he lives in France, a self-imposed exile not from the independence era but rather from FLN/military rule. And I think it was Kateb Yacine who said: "I write in French to tell the French that I am not French." That nicely captures the nature of the relationship, I'd say. I know, too, that many Algerian musicians live in France, a place for them to carry on or resume careers that they could not do at home. Here is a variation on a theme: Consider the ways in which Tony Hillerman used (exploited) the tensions between Native Americans and white Americans. Perhaps, however, more recent authors (with whom I not familiar) are similarly handling the same issue. Does this qualify under your rubric? R.T., it probably would have qualified a few decades ago. I'm not sure relations between Native Americans and those of European descent are that big a theme in American popular culture these days. I would, however, recommend Jason Aron's Scalped.